Deal News: Los Angeles to Shanghai – $668 Roundtrip! 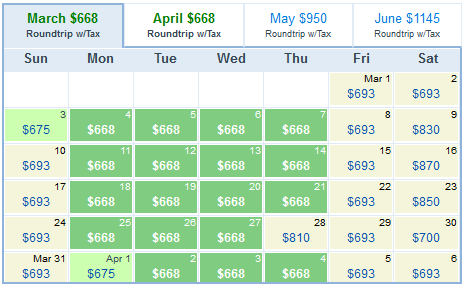 I am finding cheap flights from LAX-PVG on American Airlines for the month of March and April. The calendar shows variable prices, but well under the $1,000 range. Keep in mind, this includes all taxes/fuel surcharges. If you are looking for a cheap fare to Shanghai, then this will hard to be beat. This deal falls within some school spring break schedules, so students can take advantage of it.